Greetings from sunny Columbus, Ohio. My name is Allyson and I work here as a conference interpreter. Over the next 10 months, I will be giving you an honest, at times critical, overview of the Japanese interpreting market in the US, beginning with this article on in-house interpreting. Along the way, we will go through the manufacturing belt of the Midwest, the nationwide agencies, call centers, and community service organizations, as well as the conference circuit in the major metropolitan areas. We will also look at professional association involvement, professional development, and training in the U.S.
Let me start this series with some unbridled honesty – I did not possess the skill level of a professional interpreter when I first acquired the title of one. I was woefully ill-equipped for the job in language ability, general knowledge, and interpreting techniques. But I soon found that it does not matter in Ohio. There was such a high demand for anyone who could passably interpret, even in the middle of a recession, that those without any experience could get a job. We will discuss next time how I trained myself by using every resource I could find. But for the purposes of this article, just remember that most people who work in-house as an interpreter started their job as an untrained bilingual (not a MIIS graduate). In 1982, Honda produced it’s first car in the United States. Over the decades that followed, hundreds of materials, parts, and service providers made the jump across the pond so that they could continue their relationship with Honda in North America. The same holds true for other OEMs, such as Nissan and Toyota, which were not far behind Honda in US operations. When they expanded into a new region, so did many of their suppliers. During that expansion period of the 70s and 80s, each OEM gravitated to an area where they could draw from a wide labor force and have some autonomy from their competitors: Honda in Ohio, Nissan in Tennessee, Toyota in Kentucky, and Subaru in Indiana. This means that each of these Midwestern areas have a microcosm of Japanese business and hence, the need for Japanese interpreters. Thus, the demand for interpreters has been growing since the 1970s and continues to this day. While some companies transitioned to working entirely with freelance interpreters, and others made English their official company language, still others, especially the smaller suppliers, continue to hire their own languages services in-house. Look at any job search site and you can find several dozen postings with “Japanese bilingual” in the title in Ohio, Indiana, and Kentucky. There are even recurring posts searching for the redundantly titled “bilingual interpreter,” but we will let that slip for now. This article has bigger fish to fry! The job title for an interpreter is often, but not always, determined by the size of the company or facility. The smaller companies tend to merge interpreting with another job function such as HR, accounting, or administration. The medium size companies are more likely to hire a “Translator/Interpreter” who is expected to translate in both directions, plus interpret (often simultaneously). Only the large companies with equally large language services departments (read OEM or mega-suppliers) will have positions that are solely interpreting or solely translation. There is a distinct conflict of interest that arises when a person is asked to fill a job function in a company AND interpret. Because the person has their own job to do, s/he can never truly be neutral in a meeting. I heard from a colleague that her company’s policy was for interpreters to use the 3rd person (as in, “S/He said…”) when interpreting. When I asked why, she said that many of the interpreters had other job functions that they were fulfilling in those meetings. So, it was easier to separate the interpreter’s opinion from the person being interpreted if they use “I think…” for the interpreter and “S/He said s/he thinks…” for the person who they are interpreting at that moment. Just trying to imagine that meeting makes my head spin. I think every trained interpreter knows that if you want good interpretation, you cannot give the interpreter any other task to do during the meeting. Many of us were warned that we would be asked to take meeting minutes while interpreting. The answer is always no. You simply can’t split your attention that way. Consequently, the companies that ask their interpreters to split focus between their main job responsibility and interpreting are doing a disservice to both. This reliance on one language professional to wear many hats within the company shows how little these companies understand and value the professional services a trained interpreter can provide. The pervasive idea is that anyone who speaks a language passably in an interview can translate and interpret. Of course, this way of thinking about our profession is not unique to manufacturing. How many times have you heard someone say they took a few years of Japanese in college and want to be an interpreter? However, it is unique in the sense that these manufacturing companies are hiring a position without the faintest idea what qualifies someone to fill it or what output they should expect from it. This lack of understanding about our profession creates an environment where companies hire candidates who are untrained and then are unhappy with the result, which slowly devalues the profession as a whole. Let me paint a picture of this for you based on the worst stories I have heard. An untrained bilingual markets herself as an interpreter and applies for an in-house job. When she is hired into the company, they find that she interprets in the third person with “he said” and often interjects her own opinions without warning. She tends to summarize the content in her own way, rather than interpreting the whole meaning. Even when interpreting in simultaneous, she rolls her eyes or laughs at what people say before rendering the interpretation. In meetings, she never jumps in to interpret for someone but waits for them to ask her to start interpreting. She answers questions as if they were asked to her, not the person who needs her interpretation. She gossips with coworkers, both in English and in Japanese. Her coworkers begin to doubt they can trust her with confidential information. But, they don’t have a choice because communication must take place and she is the only bridge they have. Exacerbate this situation is the fact that many manufacturing companies do not conduct themselves like truly international organizations. They do not promote the kind of preparation before meetings and clear speech during meetings that make for smooth interpretation. The meetings in many companies are centered around either Americans talking at normal pace for native speakers, without any preparation or forethought of what they are going to say and Japanese just listening, or the other way around. Both situations are very difficult for an interpreter. So, an untrained interpreter, combined with a bad environment, leads to poor job performance and poor job satisfaction. And so, an unfortunate cycle is formed. And now, having thoroughly berated the in-house world, let’s look at its good side. To start, not all untrained interpreters are as bad as the example above. I currently contract for a company that has a wonderful interpreting team in place. The company respects their interpreters and, in return, expects high level performance and a professional attitude. The company culture demands clear, easy to interpret output from all meeting participants. But this dream-like state did not just happen overnight. I was surprised to learn that this system was put in place by interpreters who do not have an educational background in interpreting. They valued their chosen profession and put the effort into making themselves better. Then, they showed the company their value and demanded its respect in return. Now, young interpreters can come into that environment and reap its benefits. In addition, not all manufacturing companies undervalue their interpreters. I know several interpreters, myself included, who were treated like gold in their companies. Their services were highly valued, their work loads were balanced, and they were not asked to take on other job responsibilities. The reason I stayed in-house as long as I did is that my position on the organization chart was directly under the president. Talk about being valued! Which brings me to the next good point. In-house work can be an amazing learning experience. Because of the nature of working in close proximity with the same people, interpreting the same content day-after-day, you get to put attention into perfecting your craft. For example, if you have to interpret a morning production meeting that is more or less the same every morning, once you are accustomed to the flow, you can start trying out new words and phrases in the meeting, trying to find the best phrasing for original. What’s more, you often have autonomy to do things like record meetings to review your interpreting or stop a meeting to ask questions. These steps are critical for new interpreters to grow but are often frowned upon in the freelance world. You also develop a close relationship with your coworkers, who can help perfect your terminology usage and phrasing for technical subject matter. Since you are dealing with the same technology in every meeting, it is also a good way to develop a specialization. In-house interpreting can be a perfect way to start your career. There are things you can learn on the job that you just won’t learn by going to interpreting school. However, as a subset of the larger interpreting profession, it is riddled with difficulties. Even if you are a trained interpreter with a professional attitude, you may still run into the damage done by a previous interpreter. That can be the case for freelance interpreters who want to work with these companies as well. 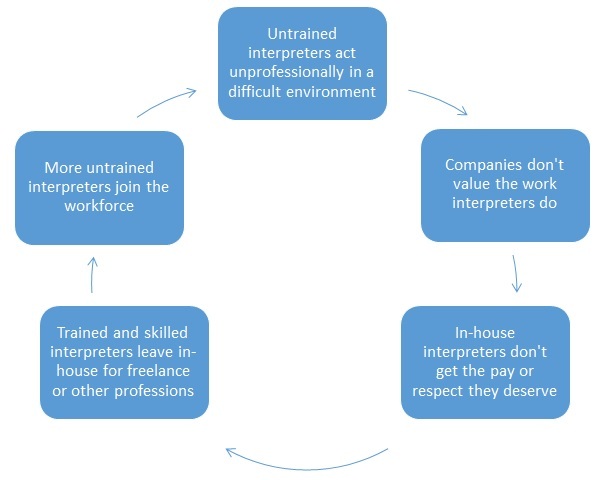 To improve this situation, it is crucial that the interpreters in these jobs educate their employers about what it means to be a professional interpreter and why they should value that service. We can explain how we can interpret better if everyone speaks slowly and clearly, as if they were presenting, not talking to their friends. We can explain the conflict of interest that arises when we have other job responsibilities. We can advocate for better hiring standards for any further hires. We can show them how much better communication will be if they treat us well and give us professional development opportunities. And then, we have to deliver.